CHINA: The first high-speed railway in north China's Inner Mongolia Autonomous Region began test runs on Sunday to prepare for the official start of services along the train line in July. 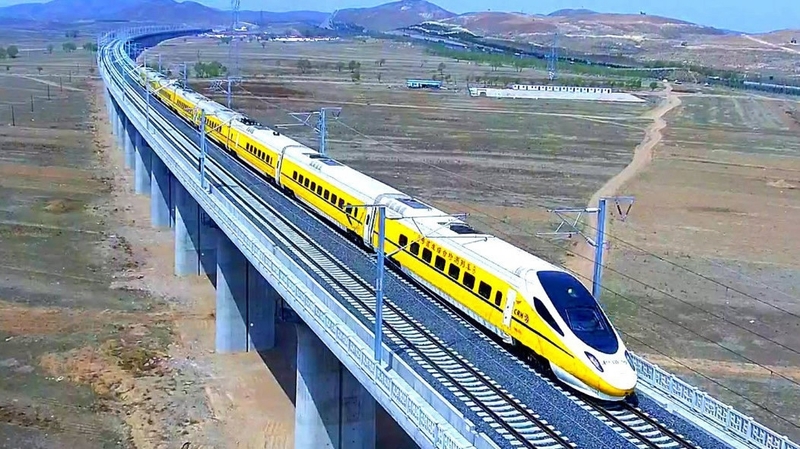 The high-speed train traveled at a speed of up to 275 kilometers per hour on a section from Ulanqab to Hohhot, the capital of the region, during Sunday's trial, according to Hohhot Railway Bureau. The section in Inner Mongolia is part of the high-speed railway that links Hohhot to Zhangjiakou in Hebei Province, the co-host city of the 2022 Olympic Winter Games. When it is operational by the end of July, the travel time between Ulanqab and Hohhot will be shortened to 35 minutes from the current one ho‍ur. The 286.8 kilometer-long Zhangjiakou-Hohhot high-speed rail, with a designed speed of 250 kilometers per hour, will be a major high-speed rail in north China upon completion. The high-speed rail is expected to be completed and put into service in 2018 and will cut down travel time from Hohhot to Beijing to three hours. It is expected to be completed and put into service in 2018. At that time, the Zhangjiakou-Hohhot high-speed rail will be connected to the Beijing-Zhangjiakou high-speed rail, which is under construction. The travel time from Hohhot to Beijing will also be reduced from the average nine hours to within three hours.